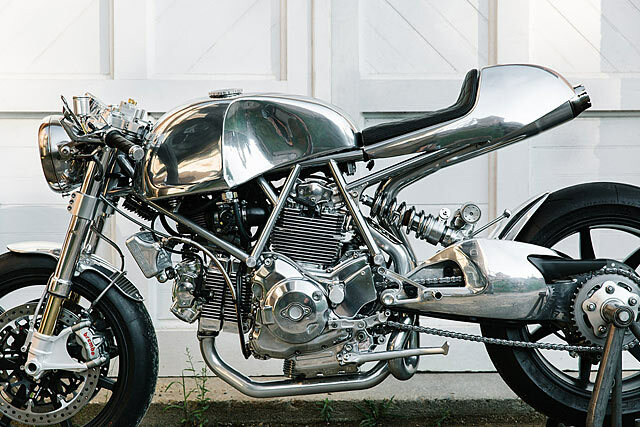 If there’s one American bike show that’s really been punching above its weight in the last year or two, it’s the Brooklyn Invitational. You know something’s up when two separate world-class builders recommend the show as the cream of the US crop to you in the same week. Actually, make that three. Why? Because clearly New Hampshire’s Walt Siegl saved his best bike for the show, too. 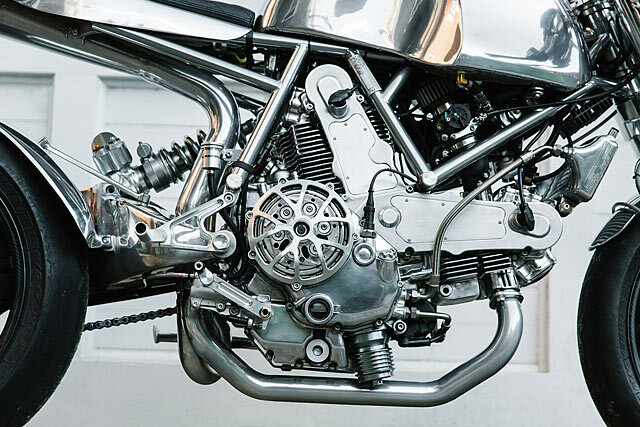 And here it is; a Ducati Monster 1100S that’s got more shine than Terminator 2. “Business is good,” says Walt. “We’re currently working on several of our Bol d’Ors and Leggeros, one of which has been commissioned by an owner of RevIt & Rizoma USA. 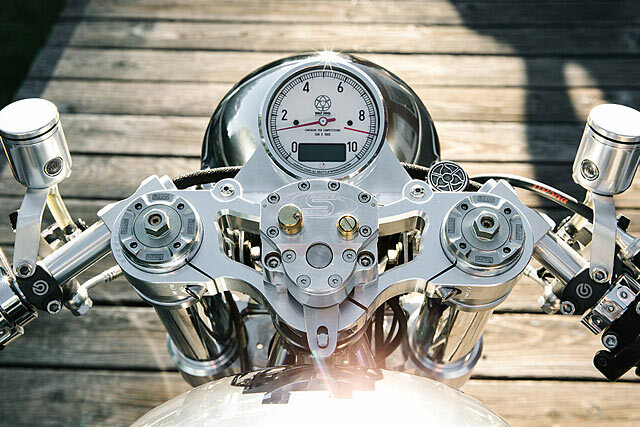 The bike will be traveling to the International Motorcycle Shows throughout the US over the next several months. We also continue to complete orders for the new Walt Siegl Motorcycles adventure model, called ‘L’Avventura'”. Walt’s also in the process of building the fourth WSM model, which is apparently going to be a Superbike. Yes, we thought that would get your attention. “The Engine choices for this model will be high-powered liquid-cooled and custom-built air-cooled units, with deep sump crank cases. The first of two commissions for this model should be completed and tested by Spring of 2018”. But enough small talk. Let’s get down to chrome tacks. 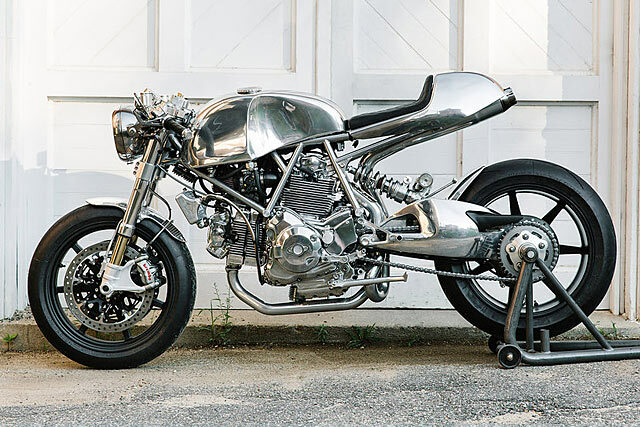 “What you see here is a special custom Leggero built from a locally-sourced 2009 Monster 1100 S engine. 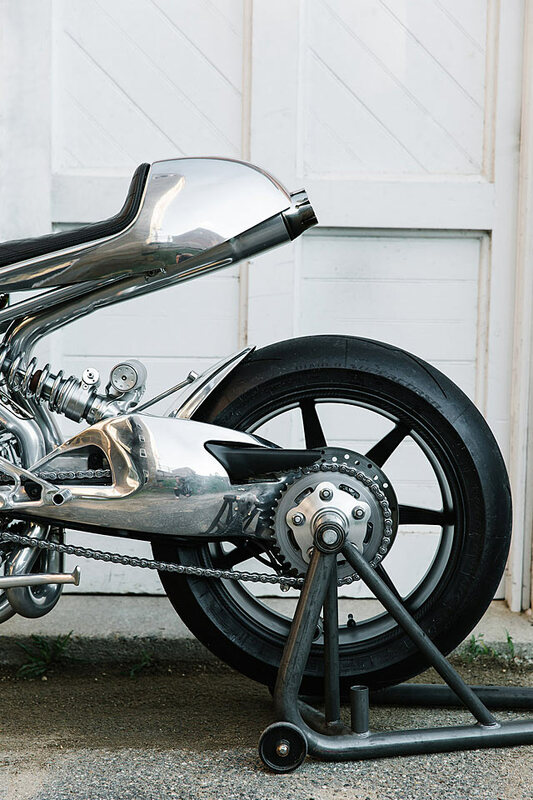 The client’s inspiration was single-seater vintage airplanes, so he wanted as many parts as possible done in polished and hand-finished aluminum”. We immediately pictured that scene from Scorcese’s ‘The Aviator’ where Di Caprio obsessively rubs his hand over the plane’s chrome fuselage. 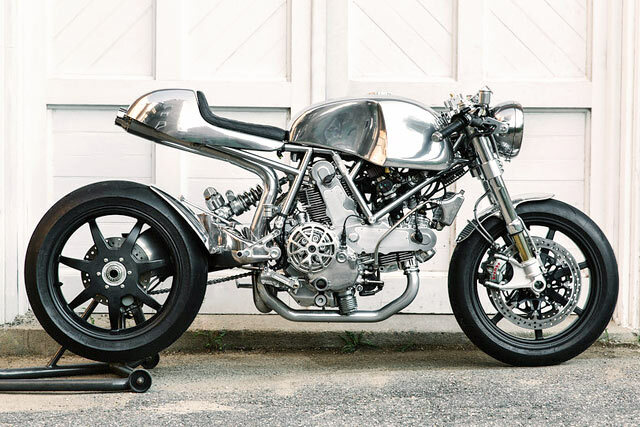 “Where normally I would use Kevlar and carbon fiber such as on the bodywork, fenders, and cam covers, we now had to build the parts in aluminum”. “We did several extended test rides with the bike, and the material really prevents the unnecessary heating of the riders’ private parts”. 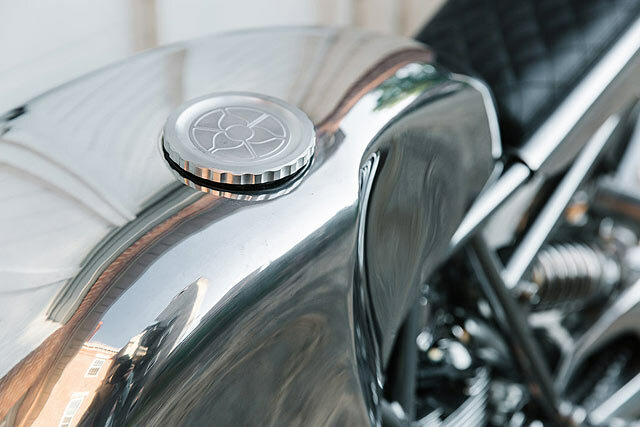 The client was also quite keen on a single muffler exiting under the seat, so not only did Walt have to custom make the system, but he also had to have a heat-dissipating coating applied on the inside of the header pipes and muffler. And when that didn’t cool things down, the inside of the tail section was wrapped with ultra-high temperature ceramic fiber insulation that can withstand 1500 degrees. “We did several extended test rides with the bike, and the material really prevents the unnecessary heating of the riders’ private parts”. “Finding the correct finishes on all the components was quite a challenge. The frame had a specific powder coating base color that I had to seal with automotive clear to be cohesive with the rest of the finishes. 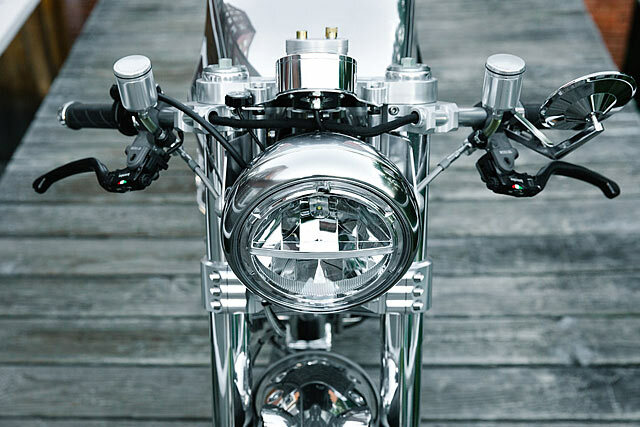 The client insisted on a magnesium swingarm, so the casting surface had to be ground down, polished and a special high-gloss clear ceramic coating applied to prevent the magnesium from corroding almost instantly”. 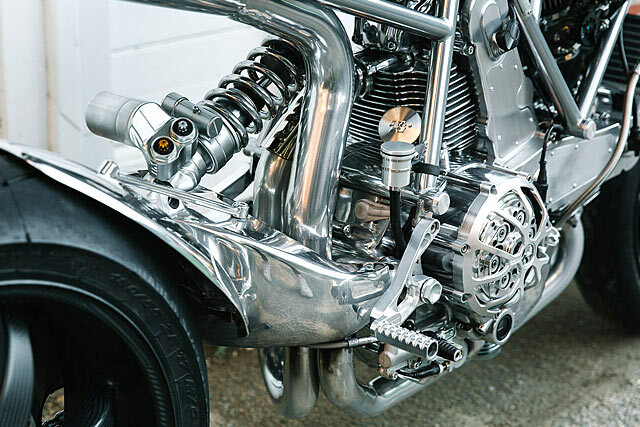 The jaw-dropping polished engine was built by Bruce Meyers, apparently the best man in the country to do the job. The unit was blue printed, its internals lightened, and the cylinder heads have been extensively worked. “We also developed our own ECU programming to get the best out of his work,” says Walt. 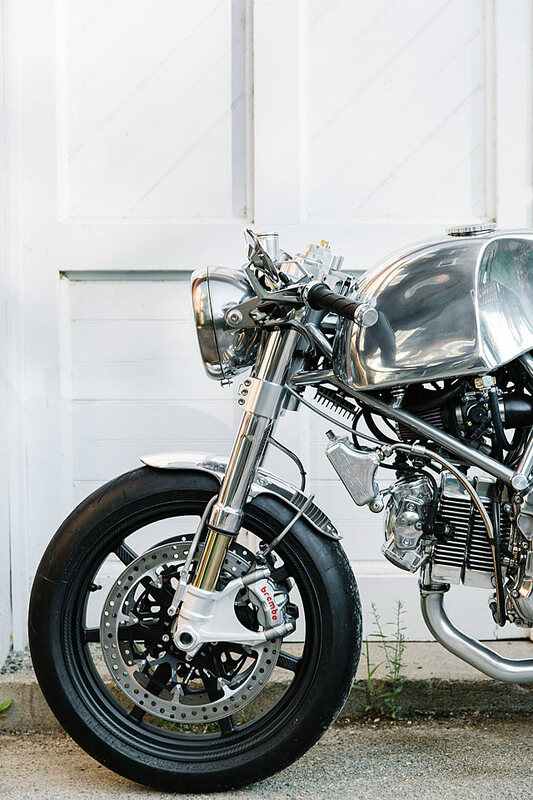 “What I like best about the finished bike is that we managed to achieve several different polished surfaces, all with the correct hue and all managing to add up to a cohesive package,” he says, smiling. “Oh, and the performance is pretty outstanding as well”. When pushed, Walt suggests that the machine is probably closer to a cafe racer than anything else, but clearly the pigeon-holing makes him slightly uncomfortable. He quickly changes the subject. “Lastly, the client named the bike ‘Brave'”. After Walt’s recounting of baked private parts, we don’t have to try too hard to guess why.